How long does it take for My Name to Appear in PMI Online Registry after Passing the PMP Exam? It takes about 7 to 10 business days for PMI to receive the exam result from Prometric. As per PMI, it may take up to 4 to 6 weeks for your name to appear in PMI Online Registry. However, in my experience, the registry gets updated within 2 weeks. It took 2 days for my name to appear in the registry after passing the exam. I took it on Aug 30, my name was published on Sept 1. Thanks for sharing your personal experience. 2 days is really quick. I remember it took longer in my case. Good to see that PMI is improving its processes. I did PBT (Paper Based Test) and at the same time as i got an email saying i got through it was listed on the registry. It only took 3 weeks to get my result. I passed on 16th december 2012, (2days ago) and received print out from exam center in the same day, after i red your posts my concern is not the registery , my real concern that my status on profile page on PMI.ORG not updated so far, so can any one please inform me, if the certefication status on PMI.ORG take time also to be updated? I passed PMP on 12th December 2012 and still waiting for my name to be published in Online Certification Registry as well as for my certification status on myPMI account to be updated. I suppose these two get updated at the same time. Hi, I have passed my exam on April 12th and still the status is not changed in my profile. I have check with PMI helpdesk and they informed it will take 5-7 days to get reflected. I have cleared the exam on July 12 at Promatic center its been 10 days still my name not yet in the registry nor did I receive congratulations mail from PMI, a print out from test center is the only proof that I am certified, how bad at least the online transactions such as acknowledgement mail from PMI, soft copy of the certificate could be little fast if not instantaneous. Where can I find "Real" PMP Exam Questions that appeared on actual PMP Exams in the past? If I Fail the PMP Exam, How Soon can I Retake It? How do I Apply for PMP Re-examination? How long is the PMP Certification valid for? What is the Reason People Fail the PMP Exam? What Percentage of PMP Applications get Audited? Which Formulas should I know for the PMP Exam? Which are the Toughest Topics on the PMP exam? Which is the Best PMP Exam Simulator? Which is the Best PMP Exam Prep Book? Is there any Official Break during the PMP Exam? How much Time is Allotted for the PMP Exam? Is there any Negative Marking in the PMP Exam? What are Pretest Questions on the PMP Exam? How many Questions are there in the PMP Exam? What is the Format of PMP Exam Questions? How do I Contact PMI if I have any Questions? What is the Value of PMP Certification? Will Anyone Know if I Fail the PMP Exam? How can I Verify a Person's PMP Credential? How many PMPs are there in the World? Does the PMP Certificate show the Score? What does the PMP Exam Score Report Contain? When do I know the Result of my PMP Exam? 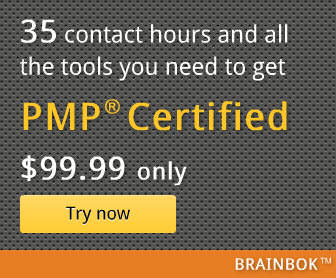 Where do I Take the PMP Exam? Is there a Fee to Reschedule the PMP Exam? How do I Schedule My PMP Exam? How can I Avoid PMP Application Audit? How do I Pay the Fee for the PMP Exam? How often are PMP exams conducted? How are PMP Exams Administered? How do I Apply for the PMP Exam? What is the Application Process for the PMP Exam? How do I Prepare for the PMP Exam? How can I get a copy of the PMBOK Guide? What are the fees for the PMP Exam? Administration Application Audit Books BrainBOK Calculator CAPM Certification Contact Hours Discount Eligibility Criteria Exam Difficulty Level Exam Duration Exam Jargon Exam Preparation Exam Questions Exam Result Exam Scheduling Exam Simulators Exam Updates Exam Version Fail Fees Formulas Identification Language Aid Paper-Based Test (PBT) Passing Score PDUs PMBOK Guide PMI Customer Care PMI Fact File PMI Membership PMI Online Registry PMP Certificate PMP Certification PMP Exam Simulator PMP Handbook PMP Renewal Preparation Time Prometric Re-evaluation Re-examination Refund Sample Questions Score Report Stationery Study Resources Value of PMP Cert. © 2017 PMP Certification FAQ | Application | Audit | Training | Study Resources by Deep Fried Brain ProjectPMI, PMP, CAPM, PMI-ACP and PMBOK Guide are trademarks of Project Management Institute Inc.